A serene holiday glow warms many U.S. cities between Thanksgiving and the New Year, but Clarksville truly sparkles as millions of lights adorn the city’s Cumberland RiverWalk and downtown city center. Rediscover the magic of Christmas at these 12 family-friendly events. Kicking off the holiday season for Clarksville is the opening of Christmas on the Cumberland, on Tuesday, November 20. Over one million lights in captivating displays illuminate the half-mile walk along the river. Special crafts, dances, choirs and other activities will take plan on December 9 and 16. This free event has become a treasured tradition for residents throughout the region. Christmas on the Cumberland continues through Tuesday, January 1 and is open Sunday-Thursday from 5:00-10:00 p.m. and Friday-Saturday from 5:00-11:00 p.m.
“Miracle on 34th Street” opens on Thanksgiving evening, November 22, at the Roxy Regional Theatre in the heart of downtown. Is the Macy’s Santa, in fact, the real Kris Kringle? Find out at this holiday classic. Having produced live professional theatre for more than 30 years, the Roxy is another holiday regional favorite. The special Christmas production runs through Saturday, December 22. For performance dates and times, or to purchase tickets online, visit roxyregionaltheatre.org. Downtown Commons Winter Ice Rink returns to Clarksville for its second season. A portion of city’s newest park, Downtown Commons, will open for ice skating on Friday, November 23 at 6:30 p.m.-10:45 p.m. Admission for ice skating will be $10 per person, which includes the cost of renting ice skates within a specified time block. The ice rink will be open at designated times through January 21, with the full park opening in the spring. For dates and times, visit facebook.com/downtowncommonstn. Drive Thru Christmas Lights begins at the Clarksville Speedway on Thanksgiving night, November 22, and continues days through January 1. Enjoy over one mile, and over a million lights, from the comfort of your car. See admission and special discount nights at www.clarksvillespeedway.com. Erin’s Farm is ablaze with Christmas activities. The seasons kicks off with WinterFest on Sunday, December 2 from 10:00 a.m.-4:00 p.m. The day includes hayrides and hot cocoa, food, activities and crafts for the kids, smore making, and family fun and games. You can also select and cut your own fresh Christmas tree on Friday-Sunday, November 23-December 16. The farm will open on Saturday, November 17 (with no activities) for those who want to cut a tree early. A gift gallery carries a variety of local-artisan produced goods, crafts and artworks. Visit their website at www.erinsfarm.com for workshop schedules and hand-blow your very own one-of-a-kind Christmas ornament. If you just want to relax and take a break from the harried pace that the holiday season can entail, check out the Roxy Regional Theatre’s Holiday Film Series. For only $5, enjoy holiday classics in the beautiful historic venue beginning with “Babes in Toyland” Sunday, November 25 at 2p.m., “Polar Express” Sunday, December 2 at 2p.m., “Disney’s A Christmas Carol” Sunday, December 9 at 6p.m., and “It’s a Wonderful Life” Sunday, December 16 at 2:00 p.m. See details at www.roxyregionaltheatre.org. The city’s 59th Annual Lighted Christmas Parade kicks off on Saturday, December 2 at 5:00 p.m. Winding its way from Austin Peay State University through historic downtown, the sights and sounds of this event will thrill the young at heart of all ages. SpiritFest, now in its fourth year, is a pre-parade event that includes a bounty of free activities. Visits with Santa Claus, rides on the Polar Express, inflatables, live music, art and gift markets, food trucks and a live nativity with animals begin at 2:00 p.m. on December 1. Visit fpcclarksville.org/spiritfest_microsite/ for more info on parking and schedules. More than 20 trees decorate the rooms of the historic Smith Trahern Mansion during Trees of Christmas. Opening Sunday, December 2 from 2:00 p.m.-5:00 p.m., each tree in this display is designed and decorated by a local club or organization. Call (931) 648-9998 for details. See hundreds of porcelain pieces that make up the large display for Christmas Town at the Customs House Museum. With moving parts and lights, and even a model train making its way through the village, the exhibit is sure to delight the young and not-so-young! Experience Christmas Town from November 1 – January 27. See more about museum offerings and exhibits at www.customshousemuseum.com. Learn how our ancestors celebrated Christmas during the Civil War at A 19th Century Christmas at Fort Defiance Interpretive Center on Sunday, December 16 from 3-7.m. Visitors will be able to step back in time to see period decorations, visit with a 19th century Santa, and enjoy eggnog, cakes, and caroling. Attendees must register in advance for a 3:00 p.m. or 5:00 p.m. time. For details visit www.facebook.com/events/639805729718953/. If you’d simply like to sit back and enjoy the sites, our local restaurants have a picture-perfect seat for you. Enjoy a fresh-from-scratch meal or local brew and enjoy the view of illumination. 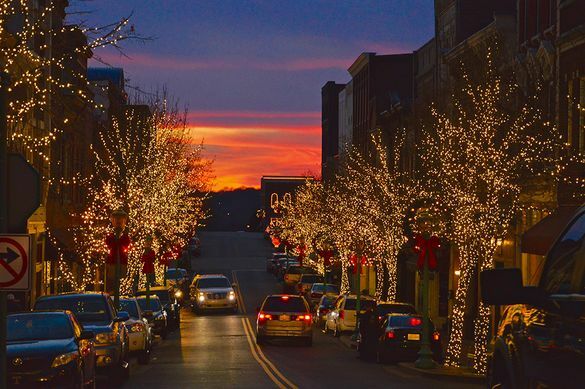 Start planning your holiday getaway at www.visitclarksvilletn.com or download our handy app to customize your trip.